Work off-line: keep working or playing, even when you don't have an Internet connection. More app, less Chrome: no tabs, buttons or text boxes. Connect to the cloud: access and save the documents locally and in the cloud. Desktop notifications: you can get reminders, updates and even take action, right from the notification center. Local device support: interact with your USB, Bluetooth and other devices. Automatic updates: apps update silently (unless permissions change). 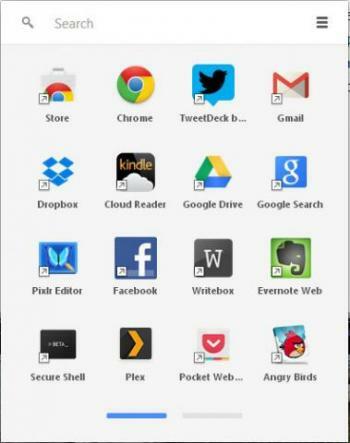 Chrome App Launcher: appears on the taskbar when you install your first new Chrome App. Chrome dabbles with off-line abilities with many of its current Web applications, but with the new Chrome Apps, this should go to an entire new level. If the hype is correct, these should be local applications, not just Web apps with off-line hooks. Also, although Chrome Apps are Windows-only today, Google promises Linux support in the future.